The curb style is generally set at ground level for lawn mowing. It is very popular in commercial lawn settings because it handles larger mower wheels and has a more massive look. It can be installed as regular gray concrete or it can be stamped and textured for a customized look. Because it is set at ground level it is not as easily seen from the street and therefore leaves a groomed look without seeing as much concrete edging. This style is available in multiple sizes starting from a 4”x6” up to 8”x6”. The mower style is very popular as it is installed to both accommodate a lawn mower wheel and at the same time retain gardening materials from it’s higher back side. 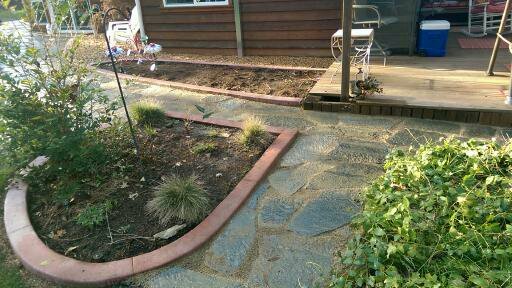 It also has great curb appeal because it sets off the landscaping with a picture frame type of look. The only option available for this style is to change the color. This style is available in multiple sizes starting from a 4”x6” up to 5”x6”. 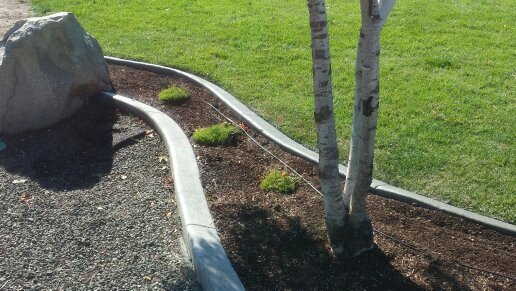 Our slant style curb is our most versatile curbing offered currently. You can change the look of this curbing by adding a stamp, texture or even the color to give it a distinctive look. 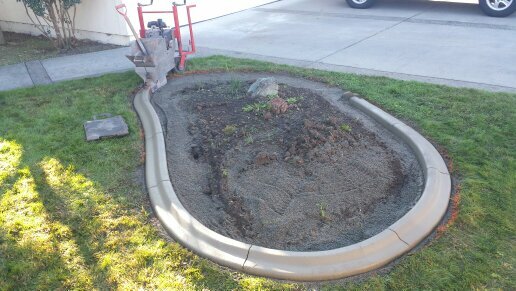 Take a look at the photo gallery for different design options this curbing allows. The slant style gives you similar mowing results as the mower style curbing while keeping the ability of changing abilities.